The A Line is not running today. KUSA — THIS is what happens when people stop being polite ... and start getting real. No, we're not talking about an MTV reality show. Instead, we're talking about the A Line, which was trapped for hours between Denver International Airport and Union Station Friday evening. The situation wasn't resolved until around 8 p.m. -- after an hours-long saga. 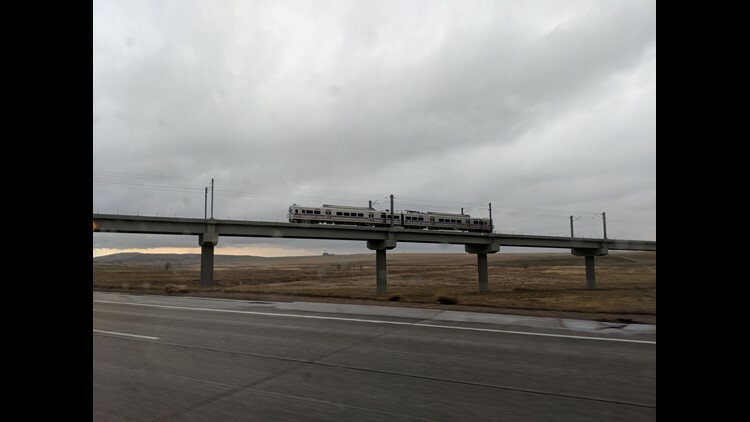 It all started just before 5 p.m. That's when RTD first tweeted that the A Line was experiencing "severe delays" due to two trains that got stuck on an overpass near 61st and Pena. Severe delays on A line trains until further notice due to two disabled trains near Pena Station. Bus shuttles are in place as an alternate. RTD called the trains "disabled" but a photo from a 9NEWS viewer showed what actually happened: the train was stuck! Far above ground! So, RTD put a bus shuttle in place for passengers who needed to get to and from the airport. Crews then got to work moving the two disabled trains. One of those trains was "resolved" by around 7 p.m. and on its way to the station, where the riders could find their salvation. But the other had to be dragged by an "operational" train, according to RTD. 1st disabled train has been resolved & is on the way to 61st/Pena to meet bus shuttles. Operational train is in place with 2nd disabled train and should be moving shortly. So real talk: If you were trapped on this train, you'd be a little upset, right? People took to Twitter to vent about the ordeal. @9NEWS @KyleClark starting to get worried about my wife. No electricity on @RideRTD A train means no heat. And after 3 hours people start to become folks they normally wouldn’t be. "Tell my fiancee I love her." But as time went on, it became more dire, and people were (rightfully) upset. @denverpost Two hours stuck on dead RTD train. No ETA. No bathroom. No answers. ??? Watching all the baseball fans on this train missing the game that they flew here to see really drives home what an embarrassment this train is to our city. Zero pun intended. @KyleClark please send help to stranded passengers on A Line! 3 hours — no one can make a decision! They won’t let us off and no bathrooms! And it begged the question: How would RTD compensate the passengers trapped on a train for hours when, presumably, they were either headed to the airport for a trip or from it to either return home or to explore Denver? And what about the people who were planning on taking the A Line but couldn't? And finally, what about the dozens of Cubs fans had traveled to see the baseball game (bless their hearts) but instead found themselves somewhere far less entertaining? 114 other people on this stranded train with me and no movement for an hour. Unacceptable. Will RTD or Denver Transit Partners be reimbursing my fare and Uber/Lyft? RTD says they will be refunding and replacing tickets, but that they can't provide reimbursement for other forms of transportation because they're a "taxpayer-funded entity." It's unclear what led to the service interruption.